The Sword Art Online mod adds more than 200 items and creatures taken from the shonen manga. 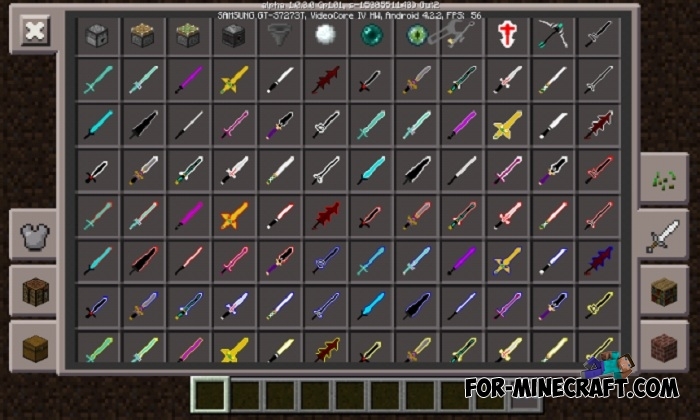 This mod includes more than 100 different swords that have destructive properties. 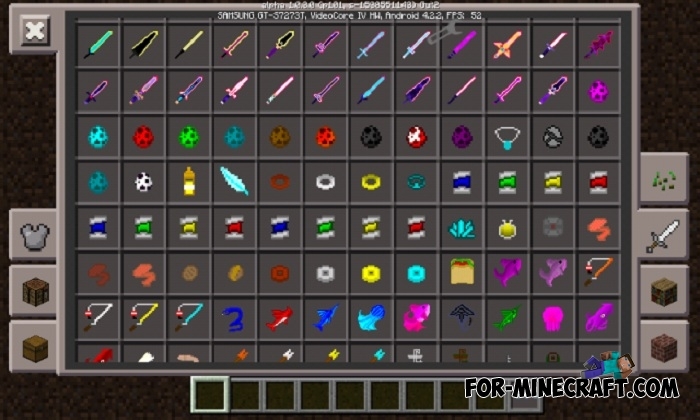 Even the Elemental Swords mod can envy such a number of melee weapons in MCPE. You have a chance to test all these weapons on characters familiar to fans of the manga. Now you can interact with mobs using dialog boxes. The ability to buy things. There are many items, food, explosives, armor, new elytra wings and other things. The list is huge and all this you can see for yourself after installation. Also, the Sword Art Online mod modifies certain parameters of the player, making it stronger and faster. Your health will increase 5 times if you dress excellent armor. Creatures can attack each other or be grouped together, some can become companions and protect you. 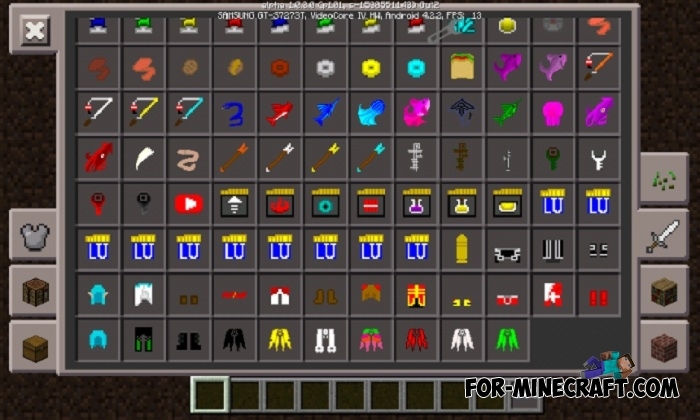 Open the inventory and carefully look at the available items, some of them interact with mobs. You can talk to other characters, just go and tap on them. A dialog box appears (currently only Portuguese is available) where you can select items. For example, you can buy some things or buy this character after which he becomes your friend and will work as a security guard. Some mobs will not let you close so do not take your sword away. Mana is filled every second and can be spent on different possibilities. In addition, you will need new weapons and tools to fight new creatures or to extract resources. The Illfang ax can cut down the whole tree if you break only the bottom block. How to install the Sword Art Online? 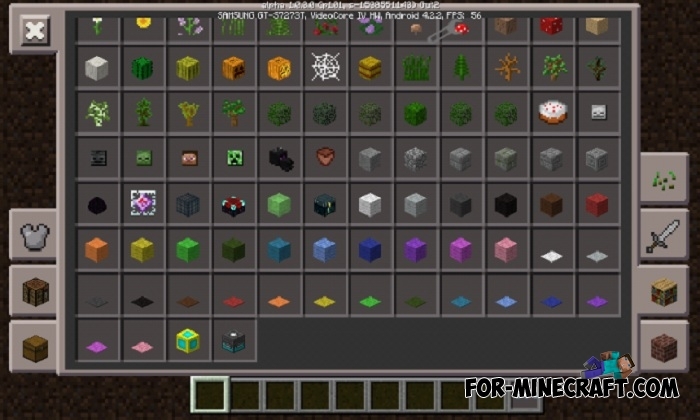 The mod supports Minecraft PE 1.0.X, version for 1.1 will appear after the release of the game. 1. Open Blocklauncher and tap on the wrench. 2. Click on ModPE and select the downloaded mod. 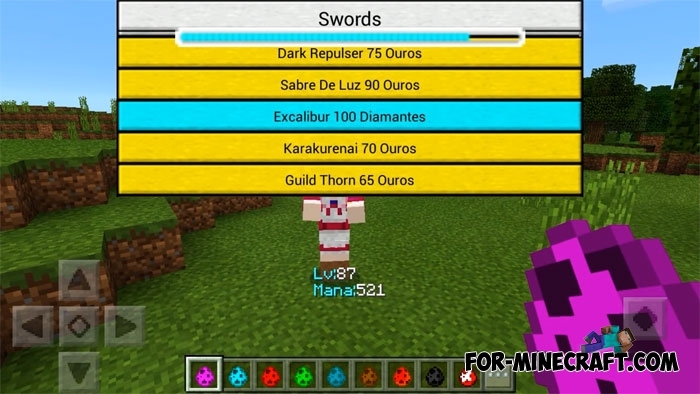 More Elytra mod v3 for Minecraft PE 1.0/0.17.0By installing this pack, you'll get more than a dozen different elytras for every taste..
Elytra Wings pack v2 for Minecraft Pocket Edition 0.17.0/1.9Of course, the elytra is one of the best features of MCPE 0.17.0. Unfortunately, but the game contains only one type of the wings..